The Health Care Chaplain Division of the Spiritual Care Association focuses on the spiritual dimension of professional health care chaplains in a number of varied clinical settings. SCA, in partnership with its 60-year old affiliate, the HealthCare Chaplaincy Network (HCCN) supports the advancement of health care chaplaincy and spiritual care as an integral aspect of whole person care for all. To become a member, click the green button below. Membership is $95 annually and it includes all the member benefits listed above. During the registration process, select the “Professional – Health Care Chaplain” Membership to be automatically added to the Health Care Chaplain Division of SCA. Chaplain Credentialing (CC): A Credentialed Chaplain (CC) has demonstrated the competencies to perform normal chaplaincy tasks in non-complex settings and under the supervision of a Board Certified Chaplain (BCC). Click here to learn more. Board Certified Chaplain (BCC): A Board Certified Chaplain has demonstrated competence to perform all of the normal tasks within the scope of practice of professional chaplains. Click here to learn more. Advanced Practice Board Certified Chaplain (APBCC): For Chaplains who have demonstrated advanced skills in the provision of and leadership in spiritual and chaplaincy care by successfully completing a standardized test of core knowledge derived from evidence-based quality indicators for spiritual care as well as a simulated patient exam that evaluates competency in direct patient care. Advanced Practice Board Certified Chaplains (APBCC) have been trained and tested in standardized curriculum based on the latest evidence in areas including department management, HIPAA regulations, the assessment, diagnosis, and treatment of spiritual distress, cultural competency, advance care directives, patient clinical care, staff support, grief, and bereavement among other essential topics. Click here to learn more. SCA’s Chaplaincy Management Training Program is designed to provide directors and aspiring directors the tools and training needed to provide successful leadership to support their staff and provide quality spiritual care to patients, family, and staff. This 4-month program, guided by experts in the field, provides a number of opportunities for interactions with the facilitators and fellow participants, creating a life-long network of peers and friends. Successful candidates will receive the Chaplaincy Management Certificate. Click here to learn more. Regularly scheduled 90-minute long webinars from experts with learning objectives that can be applied immediately to one’s professional practice. During the live webinar participants can ask questions via chat. The curriculum covers important aspects of relevant topics in blocks of two to four webinars. SCA’s Online Learning Center offers over 20 self-guided courses. The curriculum and courses are based on the standardized, evidence-based scope of practice and evidence-based quality indicators developed by interdisciplinary panels of experts from the fields of chaplaincy, medicine, nursing, psychotherapy, palliative care, social work, research and policy in the U.S. and overseas. Click here to view the online catalogue. SCA members receive special pricing. 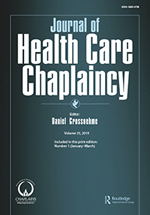 The Journal of Health Care Chaplaincy publishes peer-reviewed, scholarly articles based on original research, quality assurance/improvement studies, descriptions of programs and interventions, program/intervention evaluations, and literature reviews on topics pertinent to pastoral/spiritual care, clinical pastoral education, chaplaincy, and spirituality in relation to physical and mental health. SCA Members receive this publication complimentary with their membership.